Postcards of Davenport often appear on auction websites, but the majority are views of Bramhall Lane, often showing little more than the tree-lined road with a few pedestrians. Occasionally, however, we come across a card commissioned by a family as a portrait of their own house. The one opposite, which we have digitally enhanced from its original faded appearance, has helpfully pencilled on the back by a previous owner, 'Oberhofen, Davenport Crescent'. Street directories from 1907 (above) and 1910 (below). Oberhofen does not appear in the 1907 list; it does in 1910, mistakenly shown on the wrong side of the road. Such directories cannot be relied upon as a wholly accurate record, but they are a useful guide. Images from the digitised Heritage Directories provided by Stockport Library. The heads of the household only listed. House numbers are in the old scheme. Full records on ancestry.co.uk are images 488 to 534 (even numbers) Stockport First registration District, Enumeration District 36. 1934 Map. 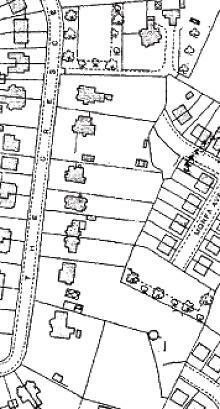 The grounds of 'Oberhofen' had by then been enlarged by the addition of the boot-shaped area of land at the rear, later sold for the building of a house, accessed from Broomfield Crescent in the bottom right corner of the extract. A family photo album dating back more than a century has revealed a forgotten slice of the history of Brinnington. In 1902 Brinnington was an exclusive area inhabited by rich industrialists, who enjoyed panoramic views of Stockport from vast countryside houses. 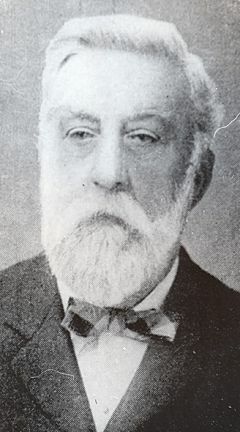 Helen Nicolayson's grandfather John Goode Johnson (above) owned Brinnington House, a grand building situated on the current site of St Paul's school. The house boasted servants' quarters, a greenhouse, stables, wine cellar and a sumptuous dining hall where the extended family feasted. Yet little was known about this era of opulence in Brinnington until Helen, 76, showed her family's photographs to community heritage officer Caroline Mean. For the grand building was demolished before the Second World War to make way for Brinnington housing estate. Helen, who now lives in Davenport, said: "My grandfather had seven sons with his first wife and then six daughters by his second wife, and they all lived in the house together. At that time they had a dining table there which could seat 30 people. Christmas must have been quite an affair. I remember visiting the house as a young child with my father shortly before it was demolished, but apart from that I still know little about it. My father Lewis Brady Johnson was a keen amateur photographer and I have kept all of the photos from this time." The Johnson family earned their wealth by managing the Henry Marsland Bleach Works, now the site of Sainsburys in the town centre. How much can we discover about the history of this house without leaving our desk? Quite a lot, since the 1911 Census returns have been published, and many houses, including this one, were built after the previous Census records of 1901. The returns in 1911 were completed by the residents themselves for the first time, and we reproduce above the part of Oberhofen's sheet listing the people who 'passed the night of April 2nd, 1911 in this dwelling ... or arrived on the Morning of April 3rd ... not enumerated elsewhere.' They were the head of the household Henry Thomas Seymour Clayton, aged 41, Solicitor, born in Ashton-under-Lyne, his wife Gertrude Mona Clayton, 36, born in Droylsden, their daughter Dorothy Muriel Clayton, born in Levenshulme, aged 14, at school, and their General Servant (domestic) Annie Brightman, 23, born in Burton-on-Trent, Staffordshire. The couple have been married 16 years, and have had just one child, who is still alive. (The 1911 Census was the first to attempt to establish the rate of infant mortality.) It looks likely that young Dorothy Muriel is the one posing with her dog in the postcard picture. She was born at an earlier family home, which the 1901 Census reveals to have been 7 Cringle Road, Levenshulme. Fortunately we can tell you more about Henry Clayton, and even see what he looked like, as he was featured on Page 305 of the book Lancashire at the Opening of the Twentieth Century: Contemporary Biographies published in 1903 which has been digitised by the Spinning the Web project. The entry, reproduced above, tells us that he was the son of the late John Clayton, Solicitor, and was born in 12 September 1869. Educated at Stamford Academy, Ashton-under-Lyne and the Grammar School, Manchester, he was 'admitted solicitor', with honours, in November 1893. His wife, Gertrude Mona, was the daughter of William Reynolds, of Fairfield, Manchester. The Freehold Company, also known as the Freeholders Company, was formed to purchase the remaining parts of the estate of the Davenports of Bramall Hall, including the Hall itself, after John William Handley Davenport decided to sell and move away in 1877. 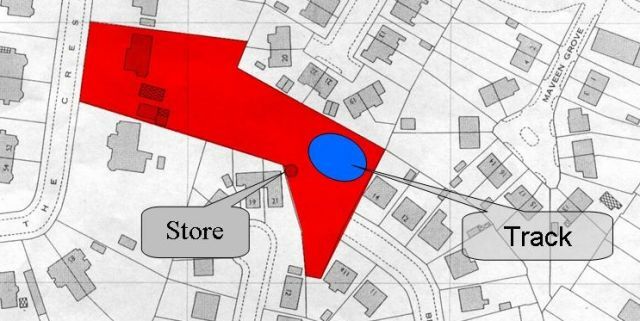 The Company laid out The Crescent and Egerton Road, and began to sell plots in the hope of creating an exclusive private estate on the lines of nearby Davenport Park on the other side of the railway, which had been sold by the Davenport Family in the 1860s. However, take-up seems to have been very slow. Trulock-Hankin and Lingard were lawyers acting as agents, and purchaser John Hooley was a nurseryman; he bought much of the east side of The Crescent, including the land on which Oberhofen was later built. 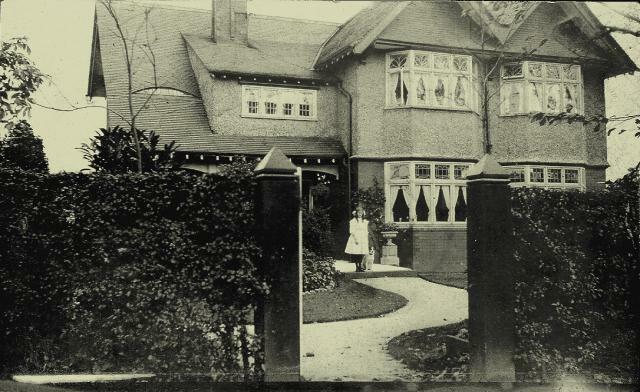 He appears as the first entry for The Crescent in a 1902 Street Directory, but his home was at 59 Edgeley Road; it would seem he initially used the land to grow plants for his business. Surely though, he would have had thoughts of property development. The map above, published in 1898, shows empty plots, including the future site of Oberhofen. A perpetual yearly rent charge of £14 created by a Conveyance dated 26 June 1903 made between (1) John Hooley and (2) Henry Thomas Seymour Clayton. Thus Clayton obtained the land, giving Hooley an income of £14 per year, and would have employed an architect and builder to create the house, which is in the style of the time but unique in its individual design. Why is the house called 'Oberhofen'? Our guess is that it was named after a favourite holiday destination; there are several resorts called Oberhofen in the German-speaking world, including a German one on Lake Constance and a Swiss one on Lake Thun. 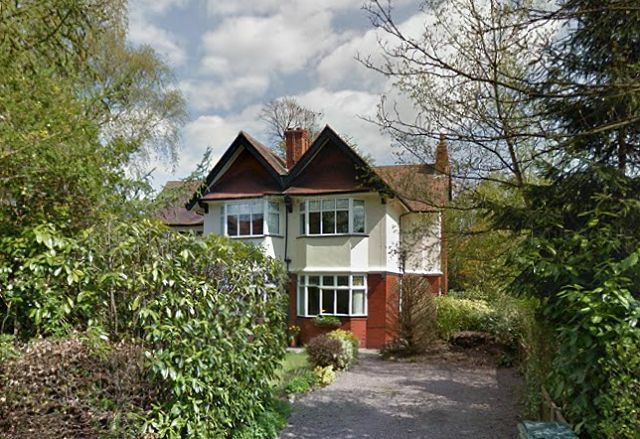 Henry Clayton died on 9 April 1930, by which time they were living at 'Coombe Lodge', Bramhall Lane South, Bramhall; his widow Gertrude died, aged 80, in 1965. As for their daughter Dorothy Muriel Clayton, online records are not sufficiently definite. By 1914 Oberhofen (known simply as 37 The Crescent) had become the home of Lewis Brady Johnson, an elder brother of Frank Stafford Johnson who lived nearby at 'The Paddocks' (see separate article on The Alders. He managed a calico bleaching works for his father John Goode Johnson of Brinnington Hall. Born in 1875, Lewis was still living with his father at Brinnington Hall in 1911, but in 1913 it seems he broke with social convention by marrying Teresa Boyd, a 21-year-old housemaid at Brinnington Hall, which may would explain the move to Davenport. We have a picture of Mr Johnson, thanks to members of the Ancestry website. They lived in No.37 for many years, and Teresa remained there after his death in 1947, until she died in 1962. 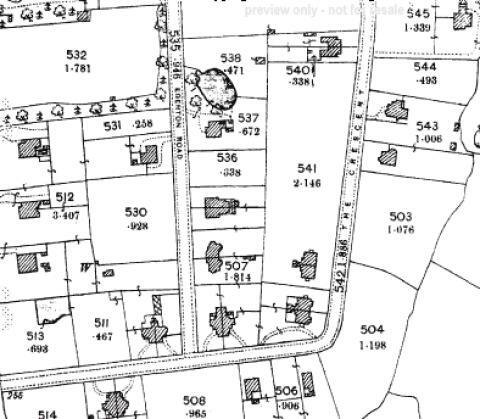 As a result of a general renumbering, to accommodate the new houses which had replaced 'The Paddocks' around 1950, No. 37 became No. 81. The next occupants were Nicolay Nicolaysen and his wife Helen Teresa Nicolaysen (the daughter of Lewis Brady Johnson) whom he had married in 1949. Mr Nicolaysen was an engineer: he became Chief Design Engineer of the Handling and Process Plant Division of the famous Stockport firm of Simon-Carves Ltd. He must have been interested in model engineering, too, as the extended grounds as the rear of the house became in 1951 the site of the running track of the Stockport and District Society of Model Engineers, who have kindly prepared for us the above plan showing the location of the track, which operated there until 1967. Access was from Broomfield Crescent. 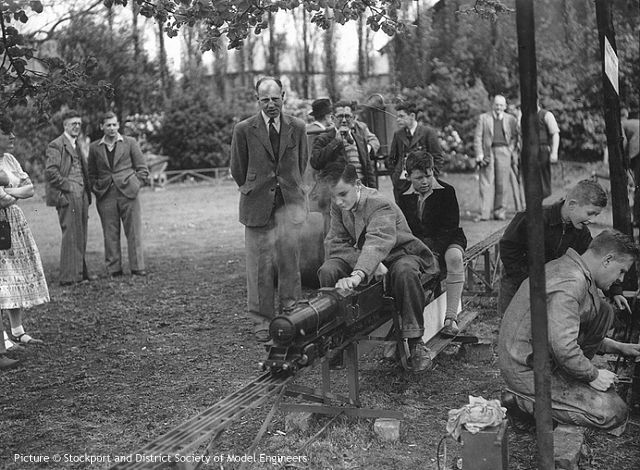 This picture, reproduced by permission of the Society, shows the track in action in its early days. The Society still flourishes on its current track at South Park, Cheadle Hulme: see the Society website for full information and more historic pictures. 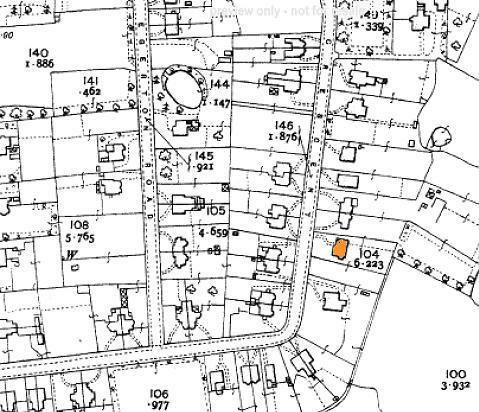 Mr Nicolaysen died in 1977; his widow Helen sold the land at the rear in 1979, which is now the site of No.16 Broomfield Crescent; she sold Oberhofen in 1987 and moved to a new bungalow (81A) which was fitted into the grounds to the south of Oberhofen. Helen Teresa Nicolaysen died in 2011 aged 84, but not before she had allowed Stockport Library to take copies of all the pictures in the family album, many of them taken by her father Lewis who was a keen photographer. In 2015, Oberhofen still stands, as Google Street View confirms (above) although it no longer carries a name. As befits the Conservation Area, externally the house is little changed from a century ago, although the gateposts have gone and the drive has been relocated to meet the demands of modern car ownership. Written by Charlie Hulme, November 2012. Update October 2015.